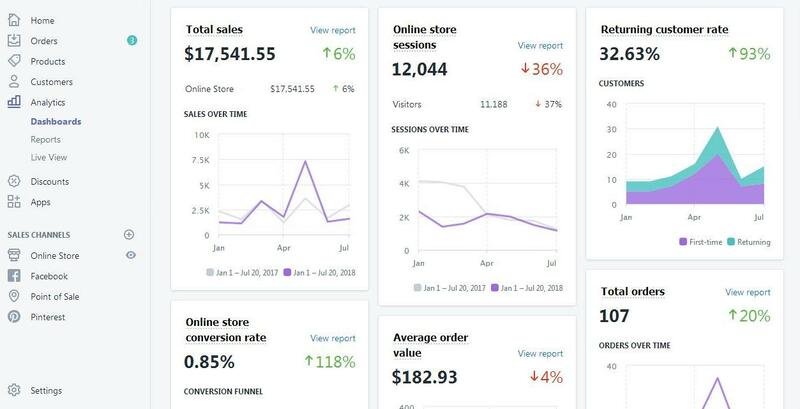 Shopify Review – Best eCommerce Platform for 2019? With the explosion e-commerce and of the online consumer market, you can sell millions of things online rather than starting a brick and mortar store. The overheads are low, the scale is international and you get a very good return on your investment. 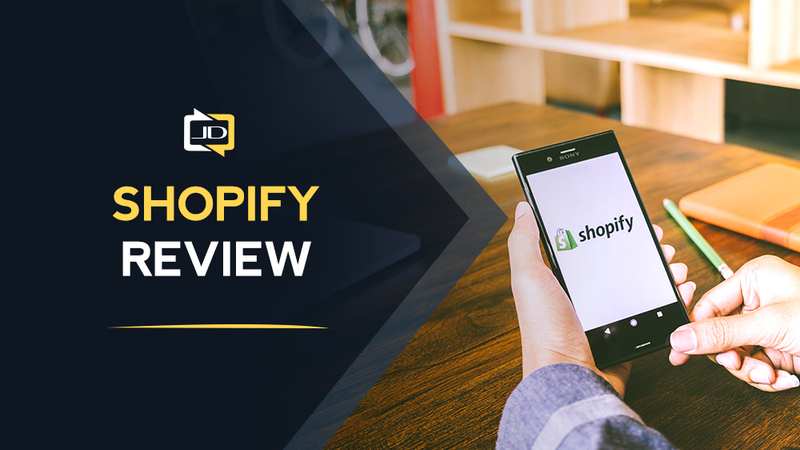 In this Shopify review, we take a look at the leader of ecommerce platforms to see all the pro’s and cons on Shopify. Let us know what you think in the comments below! There are a number of e-commerce store builders in the market. Each one has its own pros and cons. The key is to understand which platform is the best for you. 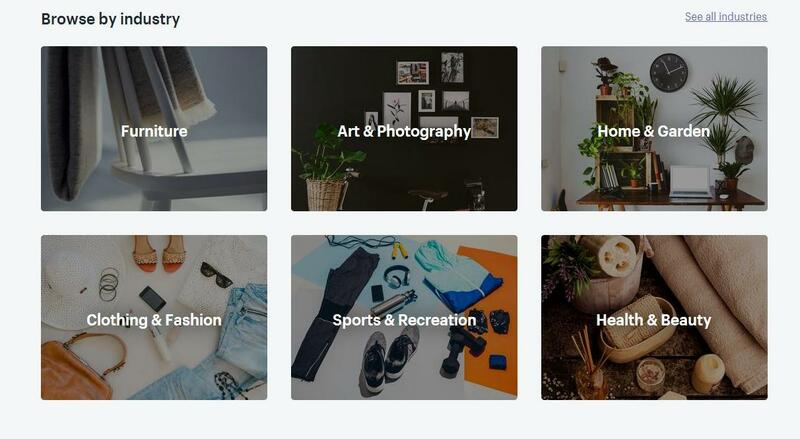 If you have an existing business and what to get an online e-commerce presence or if you are starting a new business online, Shopify makes it easy for you to set up your online store. With over half a million online stores, Shopify is one of the best online store builders in the market today. Shopify has helped store owners earn a revenue of over $40 billion. The biggest hindrance when you start an e-commerce store is technology troubleshooting. With many of the other e-commerce store builder platforms, you have great technology but you need software developers who are experts on that platform to help you to improve or structure the store. With Shopify, everything is easy and you can set up your website store easily so that you can focus on other aspects of your business like sourcing, delivery, customer service, etc. There are hundreds of theme designers and tool providers whom you can use so that they can create a uniquely designed website for you. Kylie Jenner who recently was listed by Forbes in their Women Billionaire’s list uses Shopify to power her online store. Shopify is an e-commerce platform which allows you to set up an e-commerce store so that you can sell the goods and services of your choice. It allows you to customize the look of your store, organize your products and solutions and solutions and accept credit card payments. It also allows you to track your orders and respond to them. You can so all of this right from your PC, Mac and even your mobile phone. Shopify is one of the most popular choices when it comes to e-tailers who want to set up their stores online. It is very easy and simple to use and you get a wide range of extensions which help you to improve the performance of your store. Since you don’t need to spend your time trying to understand the platform and the software, you can use your precious time to work on your business so that you can increase your sales and provide excellent customer service. It is a very simple platform to use and is very easy to improve and streamline your marketing activities when you sell via this platform. You just need to set up the platform and then start your marketing and monitor it. If you want to set up an online store and want to do so fast, with ease at a low upfront investment, then Shopify is the platform for you. Shopify is also excellent in case you want to start selling products online and you already have an offline business. If you are a drop-shipper and want an online platform to do your transaction, Shopify is still a great platform for you. There is a wide range of businesses on the Shopify platform. This includes clothing & fashion, art & photography, electronics, jewelry & accessories, food & beverages, furniture & household, home & garden, sports & recreations, and toys & games. If you have a physical product and you would like to sell it online, Shopify can help you to set up an online store to sell it. Since most business owners are not technologically advanced to the stage of understanding the back-end of an e-commerce store, using Shopify is an easy and cost-effective alternative. You can easily set up the store in hours, add your products and select the template of your choice. You can then focus your energy on other parts of your business like the product, marketing, customer service, etc. Shopify’s Point of Sale (POS) System is a system via which you can integrate the sales of your offline store with your Shopify store. In this way, you can do everything that you could in your offline store via your smart device which is connected to the Shopify platform. This gives you a lot of flexibility and location-independence. With the tie-up of Shopify and eBay in 2017, you get access to over 171 million buyers of the eBay platform. Both the platforms sync well and you get additional marketing and sales opportunities. The UPS deal of Shopify helps to reduce your overall shipping costs which will help you to increase your profits. This helps a lot if you have a low margin-high volume business. Finally, if you are in the big leagues and you have a business that earns in the 6 or 7 figure range like the example of Kylie above, you can use Shopify Plus for enterprise-level users to improve your business. In other words, regardless of the size of your business, if you want to start a new online business or if you are a brick and mortar business which wants an online sales platform, Shopify can accommodate all your requirements. Pricing is the most important thing when it comes to deciding on your online store. This is important because you have to pay a monthly fee for the store. The advantage of Shopify is that it gives to you a great online store builder at a very reasonable monthly fee. It has a great online infrastructure and an excellent customer support team. You can outsource all your technical and administrative tasks to Shopify (along with the apps) and focus on your business. The plans of Shopify start from $29 per month which is the cost for their basic plan and goes up to $299 per month for the advanced plan. You can save 10% if you take a 1-year plan and 20% if you take a 2-year plan. You can use the 14-day free trial to test the platform and then decide accordingly. You can use all the channels like Facebook Buy Button / Facebook Store / Twitter Buy Button / Pinterest Buy Button / Point of Sale across every plan. This increases your visibility to your audience and increases sales. As you upgrade to higher plans, you get an increase in the tools and features. You also get reduced credit card rates and transaction fees. They also have an enterprise-level plan which is called Shopify Plus. You can contact an advisor to get a quote for it. You can check the various plans features here. Though the transaction fees of the plans are high (we have also mentioned it in the cons), if you decide to use the Shopify Payments option to process your sales, there are no transaction fees. You will only have to pay credit card fees so that you can collect payments from your customers via their credit cards. You can use Shopify Payments to manage all your finances inside the Shopify platform. You don’t need any other service. The set-up is quick and easy. You also have an option to use a service provider like Paypal as Shopify has integration with over 70 payment processors. You will have to pay a fee of 0.5% to 2% which will depend on the plan you choose. This payment is in addition to the processing fee that is charged by the payment processor. You can also collect payments in over 300 crypto-currencies as Shopify has partnered with CoinPayments. If you want to use the POS or the Shopify Point of Sale system, you have to pay a credit card fee from 2.2% to 2.7%. This allows you to process payments from a pop-up store or an offline store. There are hundreds of free and paid professional themes on Shopify which are beautiful, extremely functional, and fast. You can choose your theme and get your online store running in a jiffy. From the start, your store will look good as it will look professional. Shopify has a theme store as shown below. You can choose from their list of premium or free themes. There are themes for a wide range of industries that include jewelry, art, furniture, and clothing. Having a store that looks professionally built is very important as it gives a sense of assurance to the website visitor that the store is genuine and they can buy things from your store as they would have from a brick-and-mortar store. Also, when the store theme is professional, it is easy to navigate and fast which increases the time that your website visitor would spend on your website and the chances of a sale increases. The great thing about Shopify is that they invite and encourage theme designers to create theme templates for Shopify stores. This allows a wide range of creativity and unique designs on the platform. The themes are checked for quality by Shopify so you can be sure that the themes are fully compatible with the platform. 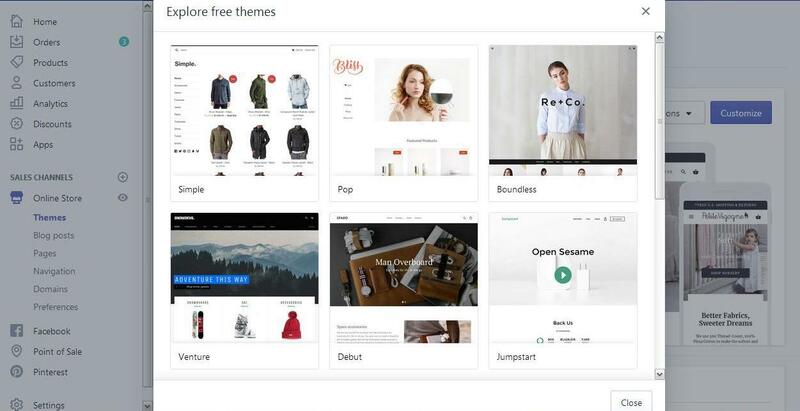 Even the free themes look very attractive if you want to start with a free theme to get a feel for the platform. You can see the examples below. With over 100 themes that are free and premium, you get a wide range of options to make your site look attractive. When you are selling online, having a professional site increases your credibility. The range of the paid themes is mostly less than $200. When you compare it to WordPress or other themes, it seems expensive. But considering it is for an e-commerce platform and that a developer would charge you ten times that amount, it is a good deal. Also, the fee is a one-time payment and not a monthly or a recurring fee. If you have the budget, I suggest that you go for a premium theme. You can select the theme that appeals to you the most in your niche and then you can go ahead with it. Another excellent feature of Shopify is that it allowed app makers to work on their platform. This gives you a wide range of flexibility when it comes to the functionalities on your website. 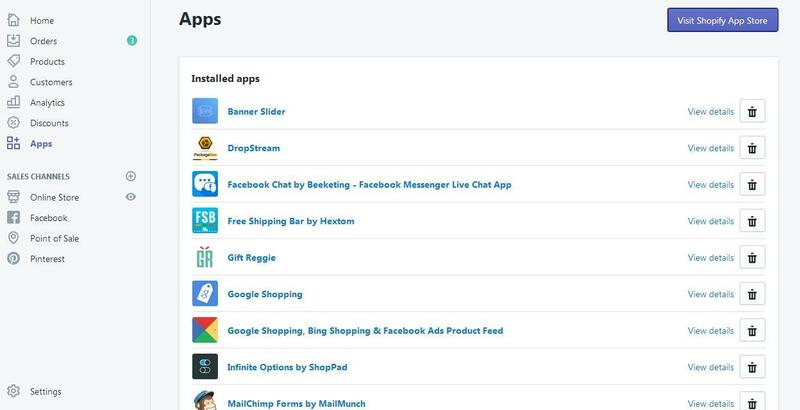 You have an option to choose from over 1,200 apps in the app store of Shopify. These apps help you will the operations and the marketing of the store. You have a range of apps from customer service, accounting, inventory management, reporting, marketing, shipping, fulfillment, social media, etc. Using these apps you can automate a fair amount of your store and you can focus your time on strategy and on other main aspects of the business. Many of the apps are free and you also have premium apps. You can selectively use the apps depending on your need. Each of the apps has been tested on the Shopify platform and they are completely integrated onto the Shopify platform. You don’t need a developer to set it up or connect it to the platform or any other app on the platform. This saves you a lot of time, money and effort. You also have apps that can add a live chat function to your online store. This increases sales and answers any pre-sales question that the potential customer may have. You can also add product review widgets which tell your website visitor what other customers are talking about your product. You can also automate the inventory and delivery process. You can sell directly on Facebook or Pinterest via apps. 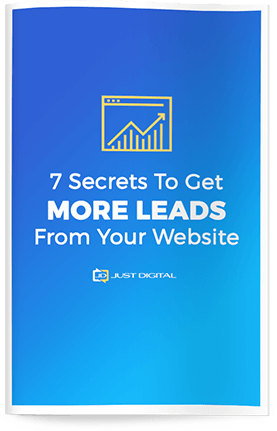 This increases your sales as it opens up huge target audiences to your products. When it comes to the learning curve for using the Shopify platform, you can easily master the basics in a few hours. There are a lot of tutorials on how to set up your Shopify store on Google, on YouTube and even on the Shopify platform. You can also avail of their 24/7 phone or online support to solve your issues. The best thing about Shopify is that you don’t need any coding to set up your Shopify store. You can just select the theme that you want and add the various product categories, etc. You can do a wide range of activities with ease on the Shopify platform. Inserting images and descriptions of the products. Shopify knows that the most important thing for any online store owner is that they should increase their sales. This makes Shopify focus a lot on improving the platform to support marketing which is not seen in most of the other online store builders. For most e-commerce stores, more than 60% of the potential customers add products to the shopping cart and then for some reason or the other they don’t complete the transaction. This is a major loss for any e-commerce store as they have already paid the marketing fees in terms of advertising, etc for getting the potential customer to their store. The customer has browsed around and has liked the products. They have even added the product to the checkout but have not completed the transaction. To make sure that they do complete the transaction, Shopify has a recovery service called the abandoned checkout cart recovery service. You can use this service if you have opted for the “Shopify” and the “Advanced Shopify” plan. This is a very useful feature as you can automatically track the users who have added products to their shopping cart but have not checked out and bought the product. The tool then reminds them via email to complete the purchase. You can customize this message which is sent to their email as per your preference and in line with your marketing and branding strategy. The way the tool works is that the email address which is added during the checkout process is recorded and automatically an email is sent to the potential customer if they don’t make the purchase. After a certain number of hours (as per your choice), the tool sends an email to the customer reminding them of the pending purchase. Each email is unique and will bring them back directly to the shopping cart where they can directly complete their purchase. This is the easiest way to make a sale as the customer has already decided to buy the product but for some reason or the other decides not to make the purchase at the moment. Creating and selling digital products is an excellent business. 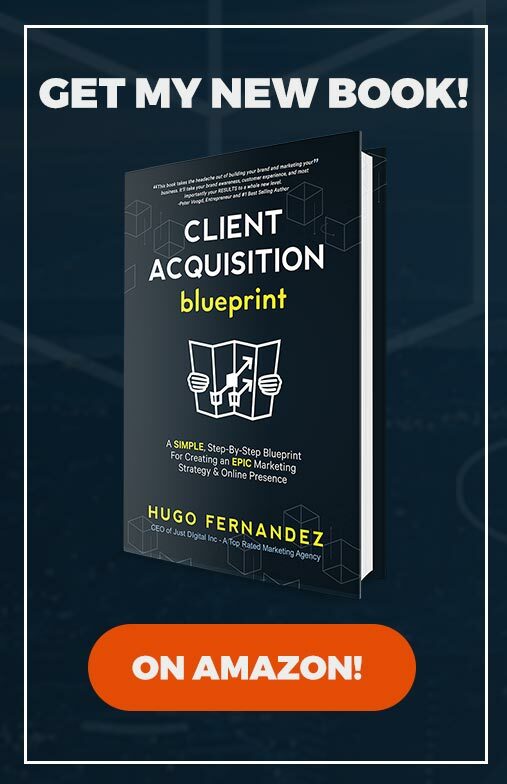 Not only is it easy to create a digital product as compared to a physical product, you also get recurring income from the sale of the product at no additional cost. For example, if you make a digital product on “Healthy diet recipes for a diabetes patient”. You can then add it to your Shopify store and sell the product via it. Shopify allows you to sell digital products easily. You just need to install the ‘Digital Downloads App’ which is a free app on Shopify. It is easy to use and you can configure it quickly. The download link with the digital product can be immediately emailed to the customer or you can send it manually. Shopify has a free e-commerce shopping cart which your customers can use to check your products directly on your store and buy the product directly from their phone. With the usage of smartphones so wide-spread, it makes sense to focus on ensuring that your customers can purchase products easily from your site from their mobiles. You can set up the settings of your mobile e-commerce so that your customers can easily make purchases from your website via their smartphones i.e. iPhones or Android phones. Shopify presents your website professionally on a mobile phone. You can also buy mobile-specific themes. In addition to your site being attractive on a mobile interface, you can also use your mobile to access the back-end of your site. Shopify gives you an option of managing your store form your mobile phone. Shopify gives you the option of two apps, ‘Shopify Point of Sale’ and ‘Shopify’. The ‘Shopify’ app will give you the option to manage literally everything on your store via your phone. You can check your orders and execute them. You can check your current products and add, remove or edit them. You can connect with other members of your team and you can view analytical reports. The ‘Shopify Point of Sale’ app is for store owners who want to use the Shopify at the point of sale option. You can use the app to take card payments physically. You can text receipts to your customers and can also track your inventory. Of the two apps, the Shopify app is of most use and it is a great tool to have especially when you are traveling and may not have access to a desktop. Even if you are not in your office, you can still access your store via your app. You can check statistics for the sales of the day, customer data and all the sales orders. The 24/7 customer service of the platform is an excellent feature that Shopify has. You may not even need to contact them as they have a very robust and effective Knowledge Base which you can use to search for answers as you can see below. In addition to that, you can contact the customer service anytime via online live chat, email or phone support. They also give you 5 international numbers to call in so that you can call the number which is the most convenient for you. One problem that we have faced when we have set up Shopify websites in the past is that the customer support is not great with answers related to the coding on the website. They are excellent when it comes to standard website queries and support. If you are looking for answers to technical aspects, you can try to get solutions on Shopify forums. 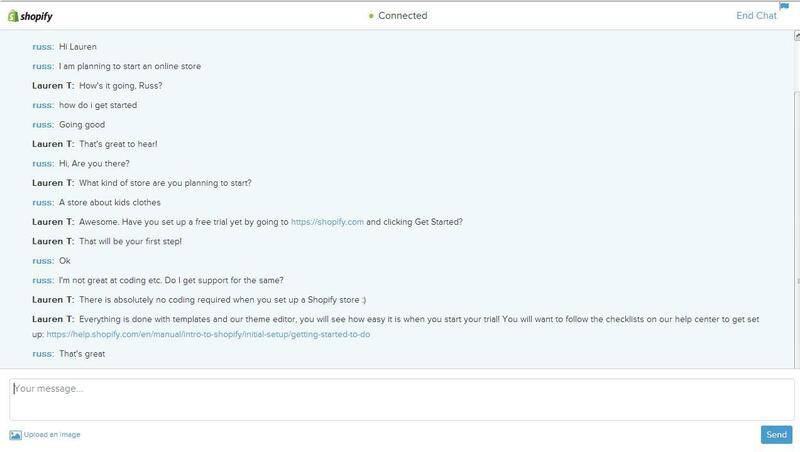 As you can see in the image below, the customer support of Shopify is quick and responsive. There wasn’t any wait time and the customer support executive responded to each of my questions within 10 seconds. When I mentioned that I want to start an online store, she didn’t just send me across to the sign-in page, rather asked the type of store I wanted to open. The responses were professional and friendly. One of the best things about Shopify is that they are very transparent about the fees that they charge. There are no hidden fees in the structure. There are a few online shop builders who have a lot of hidden feels built into the system and when you start out you feel that you will be paying a reasonable amount and suddenly at the end of the month you are hit with a big, fat bill. With Shopify, you know how much you have to pay them as your service fee at the time when you are selecting the plan and you also know how much you will have to pay in terms of transaction fees depending on the transaction value and the plan that you have selected. You also have the flexibility to change plans depending on the volume of your business. The Shopify platform has a wide array of features for the website. There are many aspects that you need to keep in mind when you run a website and Shopify have made sure that it covers a significant number of them. Certain aspects like having a blog on your website will increase your number of visitors, improves the brand value of your website and increases sales. Shopify has an inbuilt system to add a blog to your online store. Website Backup too is very important and Shopify ensures that a proper backup of your website is taken and stored in a safe location online so that you can access it if you need to restore your website. Google has started a project called AMP which encourages websites to increase their speed. With apps on Shopify, you can not only make your blog posts AMP-enabled, you can also make your product and category pages AMP-enabled. One of the biggest problems with Shopify is that when you start scaling and your volume starts increasing, you realize that you are paying a significant amount to Shopify as fees. The reason behind this is that Shopify will charge you a transaction fee for every sale. In addition to a monthly fee for the service, you will also have to pay a 0.5% – 2% fee for every transaction depending on the plan you are on. 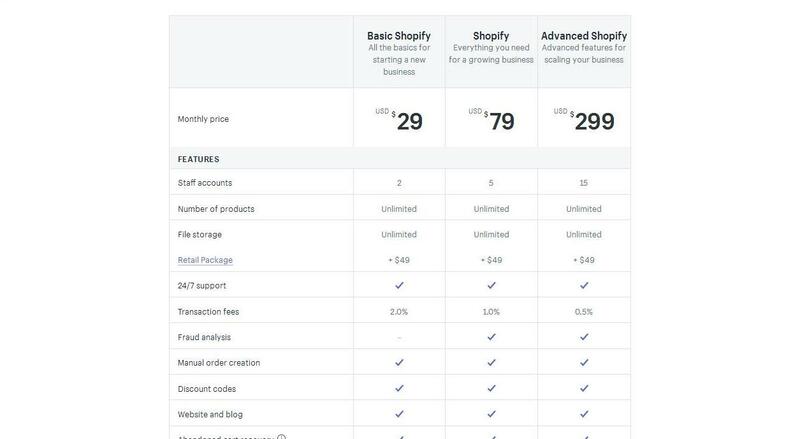 In other words, Shopify will charge an amount on the sales value for every transaction. If you are on a basic plan, they will charge you 10%. If you are on a Shopify plan, you pay 1% and if you are on an advanced plan, you pay 0.5%. To put the amounts in simple English, you need to pay $0.5 to $2 for every $100 that you make in sales. The issue comes when you have products of a very small margin since you are paying a cost on revenue rather than on profit. In addition to that, you also will have to pay the monthly service fee regardless of if you have made any sales via the online store. The reason for the fee is that Shopify needs to cover their technology costs. Additional sales mean additional visitors which eat into the server bandwidth of the Shopify platform and they need to cover their expenses. Since Shopify manages the whole store and the upfront cost of setting up the store is minimal, so the transaction cost is not really a big issue. For example, if you have made sales of $10,000/- you may not have a major problem with paying Shopify an additional $50 to $200 depending on your plan. Also, when you are starting out, higher service fees are a deterrent as you are not sure of the sales. The structure wherein they charge per transaction is much more preferable. If you are using Shopify Payments for your payment transactions you don’t need to pay any transaction fee. Since too many website owners, their website is their baby, they want to constantly tweak and improve on the website. If you want to constantly improve on your website, you will either have to hire a programmer or will have to learn “Liquid”. Many website owners are used to HTML and CSS (coding languages), but you can’t depending on it completely as Shopify uses its own language. Even if you want to hire a programmer you will need one who knows the Shopify platform and may be more expensive than other programmers as they will be a specialist. This can add to the cost for you. A better option would be to choose from a variety of premium themes that are available on the Shopify store and then when you start earning money, consider making customization. You may also be able to make the customizations using apps that are available on the Shopify store. You should check them first to see if it will help before you search for a developer who may be expensive. You have a wide range of apps on the Shopify store which will make your life easy and will help you to automate your store. However, from the 1,200+ apps that are there in the store that will improve the functionality of your store, many of them are paid apps and they charge you a monthly fee for use. The issue with monthly fee apps for your website is that your monthly costs start increasing. The best option is to check for free apps which offer the same service as the paid apps and see if you can still run your business successfully without too much effort. If your sales are increasing and the apps will help you to automate certain aspects of the business and save your time, it makes sense that you get them. The apps are there so that your life gets easier and you are able to work faster and more efficiently. Also, you may be using other paid services, for example, accounting software which you can stop when you start using the paid app on the Shopify platform. This way you will reduce your costs. You need to balance the amount that you will spend per month on the various apps and the time that you will save from having the apps. You can scale your business and automate it using apps which may not be available on other store builder platforms. Overall, Shopify is one of the strongest and most reputed e-commerce store builders in the market. They beat other store builder platforms on two important fronts. They are easy to install and attractive, unique looking storefront themes and a wide variety of apps to add functionalities to your online store. When you have an attractive storefront theme, your online store looks professional which gives a fair amount of assurance to the visitors and your sales increase. The Shopify apps improve the functionalities of your online store, automate processes and increases sales. Since Shopify knows that they can’t give you all the features that you will require to create an amazing website and they can’t provide the extensive functionalities that are required, they invited designers to integrate their designs into the Shopify platform. They invited app designers to create apps and tools for the Shopify platform. This gives you a huge advantage as a store owner on the Shopify platform. You are allowed to use the flexibility of the platform to improve your store at the fraction of the cost that you would have to pay if you were working on another platform. With Shopify, you have the ability to bootstrap your online store. You can start with a basic plan and a free template and can keep adding premium templates, various apps and increasing your plan as your business grows and the money comes in. If you have an offline store, Shopify’s Point of Sale (POS) system helps you to grow it and you can process your sales even when you are not on your computer. You can use your smartphone as your store so that you can travel and still keep an eye on your business. From November 2017, Shopify has also added a UPS option. You can reduce your shipping rates using it. This is something that is very special about the Shopify platform. 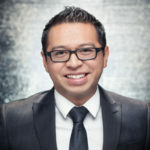 They keep working on ways to improve the life of the store owners on their platform and to be at the top of the game. When you decide to have an online store, the most important thing that you need is a strong and flexible platform which is capable of supporting all your online operational and marketing needs. The beauty of Shopify is that it is a flexible and a very strong platform. The customer service is excellent and you don’t have to focus on technology and you can work on other aspects of your business. When it comes to a hosting solution for your online store, Shopify is one of the best there is. You can use it if you want to sell your products online, offline and on social media channels. You can also use it if you want to drop ship products. Shopify is easy to use and it integrates with a lot of apps along with having templates that will make the website of your store look very attractive. Since Shopify has over half a million users, you know that it won’t just shut shop one day and you will have to move a successfully running store to another platform. Though the transaction fees are a major disadvantage as it eats into your profits, you can opt for Shopify payments which are free. You can do so though only if you are based in the United States, Canada, Puerto Rico, Ireland, the United Kingdom, and Australia. In case you want to sell from any other country, you will have to use a third-party payment gateway which gets expensive. Also, the cost of the apps may add up so make sure that you purchase only the ones that you need. You can take advantage of the 14-day risk-free trial that Shopify offers so that you can check if Shopify fits your needs. If you need help setting up Shopify, contact us here for a custom Shopify design quote. Let us know what you think of this Shopify review in the comments, and let us know what your favorite Shopify features are.